GuideStar for Grant Applications will allow applicants to populate answers to specific questions with data from their GuideStar profiles. Note: For information on how to incorporate this new functionality into your site, please contact Foundant support at support@foundant.com. By default this feature is turned off. 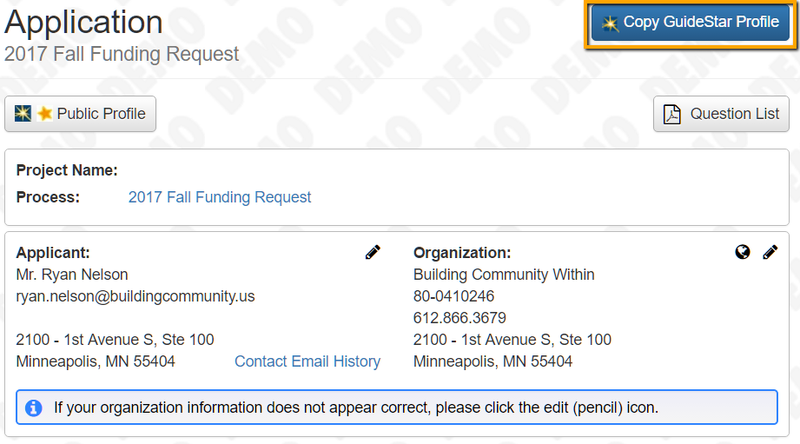 A new question type - “GuideStar Profile Question” - will be an option when adding a question on Form Builder. Applicants will see a “Copy GuideStar Profile” button in the upper right hand corner of any forms that include GuideStar Profile Questions. A GuideStar icon will appear next to all GuideStar questions on a form. When applicants click the “Copy GuideStar Profile” button, a popup will display the answers available to copy for this particular form. Each profile answer can be copied individually, and the user will also see the contents of each profile answer. Note that copying answers will not overwrite any existing answers.